Springbok captain Siya Kolisi took some heat recently for saying that he does not want to be picked because of the colour of his skin, and that former President Nelson Mandela would not have supported a quota system in South African sport. But it was a comment on his schooling from the first black man to ever captain the Springboks that caught my eye. “If you want to talk about transformation, you have got to start there (at a school level)”, said Kolisi. How true is that for most Springboks? Let alone the Boks of colour! OK, not the English part, but the part about nutrition, conditioning and training. “Transformation” via the top-down quota approach is the easy way out because it is simple to monitor. And perhaps more importantly in our teetering society, a platform from which simple political points can be scored. The much more difficult approach – one that requires planning, a well thought-out strategy, and resources – is the one that starts from the bottom. And schools would need to form a vital cog in such a plan, hence Kolisi’s comments on Madiba probably being in favour of such a plan ahead of quotas. But with the number of boys playing rugby at school on the slide, what should be a key cog in any transformation plan is fast becoming a concern for the sport in general. Not only in SA, but in the world’s top rugby nation as well. An independent review of New Zealand secondary school rugby reveals that numbers of boys playing rugby at secondary school is trending downwards at an “alarming rate”. A key finding in the report is that stacked First XV schoolboy rugby teams are a massive factor in the decreasing playing numbers. The report was also damning of First XV rugby and the recruitment practices of some schools. “In general, they view the pooling of talent into a few strong rugby schools as a significant factor in the decrease of numbers playing the game because of flow on effects of, for example uneven competitions,” was the opinion of people surveyed for the report. Many were of the opinion that there needs to be better balance between schools developing their own talent versus bringing in talented players from other schools and provinces. In 2018, 11 Auckland schools threatened to boycott games involving St Kent’s school over what they believed were unacceptable levels of recruitment. In South Africa we have already seen a fair amount of that, the most recent being in the Cape, where Paarl Boys’ High were forced to respond to accusations from SACS and Wynberg that they have been guilty of player poaching. In both instances, the boys are players of colour, a factor that adds yet another level of complexity to an already tricky scenario. Quite clearly, Paarl Boys are recruiting. And quite clearly, they are stacking – when last did a southern suburbs side beat them? But are they not also offering these boys, clearly intent in pursuing rugby as a career (a topic for another column), an incredible opportunity? And if quotas are how we judge transformation, then why should Paarl Boys not be recruiting players of colour? Which, apart from opening up a very smelly can of worms, might also give some insight as to why Siya Kolisi thinks that Nelson Mandela would probably not have been in favour of quotas. Player ‘poaching’, or ‘recruitment’, is part of a much broader issue, and it is a symptom, not the malaise itself. And this should be the central debate in schoolboy rugby. Not the winning, not the trophies, not the glory – but the outcome for the boys themselves. Are they being best served by being put through almost professional-level programs at a young age, only to realise later in life that they peaked at 17? But with the Paarl Boys vs SACS and Wynberg debate going on, and the fact that we now have reports stating that player numbers are dropping, I thought the link with Siya’s comment around schooling was worthy of a discussion. The world is a competitive place and those with a clear strategy will usually prevail, so I find it difficult to criticize schools for following their plan. Could it perhaps be that they are doing it a whole lot better than other schools? Camps Bay High has a strong surfing fraternity, Westerford, openly recruit academics, so why is it wrong for Paarl to recruit rugby talent? It is ludicrous to suggest that there is only enough talent to fill one or two first teams, particularly in the Westetn Cape, I suspect it is more a question of what said schools do with that talent once they have it! All these top schools teams recruit they just don’t like it when it happens to them. Once the boy is In a decent rugby school there is little additional benefit to the player in going to a slightly better school. I have been saying it for years: SARU/Department of Sport need to hire scouts to visit township rugby clubs, identify promising kids and get them into established rugby schools on government/SARU bursaries. That way these kids will benefit from good coaching, a rugby culture and proper sports nutrition. 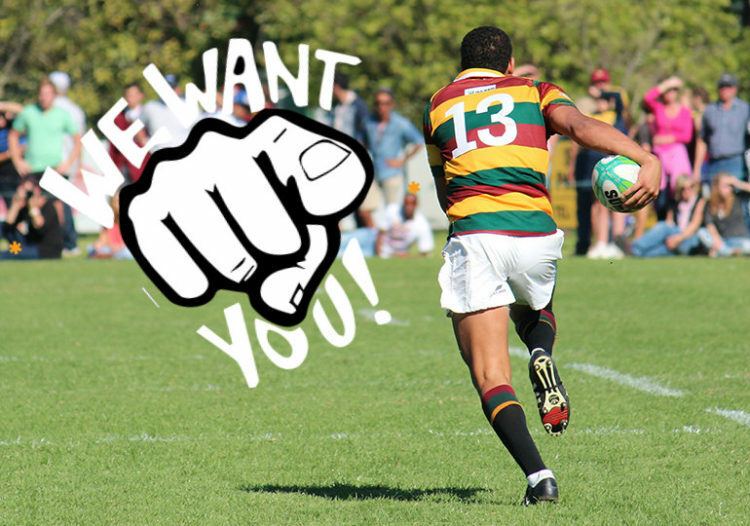 They will also be front and center when Craven Week scouts come looking. That will mean that they will be on equal footing as their white counterparts with regard to turning professional which will mean that no quota will be required – the cream will rise to the top. As for poaching – when I was at Maritzburg College a certain u16 player was offered a fat bursary for assurances that he would attend university down in the Cape. We also had an entire u14 front row mysteriously move to Glenwood midway through the first term. But the undisputed master of “recruitment” is Grey Bloem – they’ve been doing it for decades. No wonder there aren’t really any other top-notch FS rugby schools – Grey are sucking all of the air out of the room. And now the Grey conveyor belt leads to France with French clubs sponsoring French lessons for their students. It may be great for the individual boys, but probably not so great for South African rugby in general. I fully agree with you regarding the strategy of giving disavantaged children a chance. You make a lot of sense in that regard. Yeah, I am appalled that Grey Bloem can get away with that. This is where SARU needs to pull some finger and set certain policies in place. I sincerely hope that Rassie can help with this in his role as Director of Rugby. Question is, who’s the next Springbok coach going to be? Warren Gatland is looking for a job………. There is no way Gatland would take the Bok position. Hell, given all the politics and racial quota rubbish I wouldn’t want the job either… and I’m passionate about the Boks! I think there is a societal issue most of us are missing, with the advent of the internet, mobile phone and E-Sports there are so many more distractions luring kids away from ALL sports. None of those things were around when I was a kid, we used to play cricket in the street between 2 dustbins and “dryfentjies” in the park at age 8 or 9. I remember kids that could sidestep down a touchline that would make a lot of Super Rugby players look like clowns. The only entertainment we had WAS sport,—-LOL we didn’t even have TV those day,–you listened to the radio for entertainment. There is no easy answer but Siya is totally right, if SA is to compete it needs to find a way to get those kids not corrupted by “technology” into the system at an early age, –once they have an X-Box most of them are lost to sport. SweetAz you onto something here about E-Sports being a threat. Gone are the days of seeing kids playing tip and run in the park and rugby with a coke bottle. Kids today are playing on PC/Console or a phone and we need to be careful to encourage participation of as many kids as possible at school level in stead of spending a lot of money on a few semi proffesional school boy players. Schools used to take pride in the number of teams they fielded 7th/8th Sides and those schools invariably had some of the best 1st teams as well. Lets hope that they don’t loose site of that.